A Naval Academy graduate, Captain Franklin Van Valkenburgh spent over three decades training for combat. He saw action for only the last few minutes of his life. 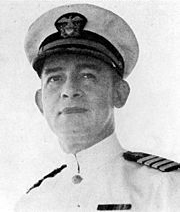 Assigned to the USS Arizona in February of 1941, he ran a tight ship. The men were well-trained through battle scenarios and tactical exercises in the Pacific around Hawaii. On Sunday morning, December 7, 1941, the Arizona’s air raid siren sounded at 7:55, followed by general quarters. Van Valkenburgh was seen sprinting for the bridge in full uniform. Secretary of the Navy Frank Knox told reporters three months later that a burst of shrapnel hit Van Valkenburgh, tearing into his abdomen, as he emerged from the conning tower to the bridge. He fell to the deck, but refused to be moved so he could continue to direct the defense of his ship. Van Valkenburgh’s body was never found, only his 1909 academy class ring and two buttons from his uniform. He was posthumously awarded the Medal of Honor for conspicuous devotion to duty, extraordinary courage and complete disregard of his own life. You wonder how many other stories would be written the same way. 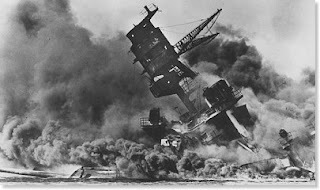 There was no combat during the 1920s and 30s so all the men training for that never saw combat until Pearl Harbor and so many died that day. How sad!